■ CBS’s Dr. Jon LaPook: Before joining CBS, LaPook gave $4,000 to Democratic presidential candidates Al Gore, John Kerry and Wesley Clark, plus a hefty $20,000 donation to the DNC. LaPook’s wife, liberal TV producer Norman Lear’s daughter Kate, has doled out more than $100,000 to Democrats, including the maximum $4,600 to Obama. 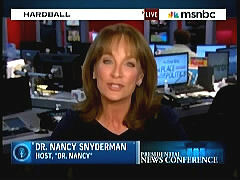 ■ NBC’s Dr. Nancy Snyderman: The records show two contributions totalling $800 to Democratic congressional candidates when Snyderman worked at the health care giant Johnson & Johnson after her stint at ABC News and before joining NBC. When she worked at ABC, Snyderman was a Lincoln Bedroom guest of Bill and Hillary Clinton (catalogued under "Arkansas Friends"). On the May 1, 2000 Good Morning America, Snyderman revealed that Hillary Clinton was the lawyer who handled her 1988 divorce. “What did she say to you about a philandering husband?” host Charlie Gibson wondered. Snyderman wouldn’t say. There is just one fact I want to let everybody hear: We spend more than twice as much, per person, on health care in this country as the average of all other industrialized countries, yet we’re the only one that doesn’t have universal coverage. That’s a national shame and I think, ultimately, that’s what’s going to unite Democrats and Republicans. Network health reporters are supposed to ask the tough questions before ObamaCare becomes the law of the land. Can’t the networks find at least one independent voice to apply a little scrutiny, before it’s too late?